The Civil War was a conflict between the United States of America and the Confederate States of America. The war took place between 1861 and 1865. John Brown’s raid on Harper’s Ferry, Virginia. Brown is hanged for murder and treason at Charles Town, Virginia. John Wilkes Booth and Stonewall Jackson watch the execution from the crowd. Lincoln’s election triggers South Carolina to secede from the Union. Mississippi, Florida, Alabama, Georgia, Louisiana, and Texas secede from the Union. Kansas is admitted as a free state. Delegates from six seceded states form a government. They elect Jefferson Davis President of the Confederate States of America. Fort Sumter is attacked by South Carolina troops. Fort Sumter surrenders. Lincoln calls for 75,000 volunteers to enlist in the military. Colonel Robert E. Lee resigns from the United States Army and takes command of Virginia’s troops. Union troops capture Alexandria, Virginia. After being killed by a local innkeeper while trying to remove a Confederate flag from the roof of the building, Union Colonel Elmer E. Ellsworth, a close friend of Abraham Lincoln, is the first casualty of the war. Four slave states stay in the Union: Delaware, Kentucky, Maryland and Missouri. The Confederates win the First Battle of Bull Run. Confederate General Thomas J. Jackson earns the nickname “Stonewall Jackson” for his bravery during the battle. General George B. McClellan replaces General McDowell as the general-in-chief of the Union armies. Prince Napoleon visits the White House and meets with Abraham Lincoln. Napoleon attends a disastrous dinner party at the White House later that evening. Lincoln fails to convince the prince to pledge support for the Union army. Julia Ward Howe composes the lyrics to “The Battle Hymn of the Republic.” The lyrics are published in the Atlantic Monthly in February. General Ulysses S. Grant and his troops capture Fort Henry and Fort Donelson in Tennessee. General McClellan loses command of the Union army. He is given command of the Army of the Potomac and is ordered to attack Richmond. Union General Ulysses S. Grant and his troops win the Battle of Shiloh in Tennessee. Commander David G. Farragut captures New Orleans. Stonewall Jackson and his Confederate troops win the Battle of McDowell in Virginia. General McClellan’s army retreats, ending the Seven Days’ campaign. The Confederates win the second Battle of Bull Run. The Union wins the Battle of Antietam in Maryland. As a result of the Union victory at Antietam, President Lincoln issues the Preliminary Emancipation Proclamation. General McClellan loses command of the Army of the Potomac. The Confederates win the Battle of Fredericksburg. Lincoln issues the Emancipation Proclamation, freeing slaves in the seceded states. President Lincoln signs a federal draft act. Abraham Lincoln signs General Order No. 100, also known as the Lieber Code of 1863, vowing retaliation against Confederates who sell black POWs into slavery. The Confederates win the Battle of Chancellorsville. Stonewall Jackson is wounded during the battle, develops pneumonia and dies on May 10. Confederate cavalry fight the Union cavalry in the Battle of Brandy Station in Virginia. The battle is inconclusive. 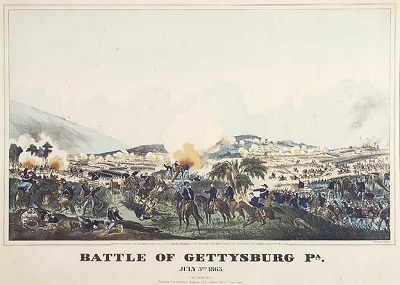 The Union wins the Battle of Gettysburg in Pennsylvania. Confederates surrender Vicksburg to Ulysses S. Grant and the Union army. The Confederates win Battle of Chickamauga in Georgia. Lincoln delivers his Gettysburg Address. The Union army wins the Battles of Chattanooga in Tennessee. Ulysses S. Grant is officially appointed commander of all the armies of the United States. The Confederates win the Battle of Fort Pillow in Tennessee. The Battle of the Wilderness in Virginia takes place. The battle is inconclusive. The Battle of Spotsylvania Court House in Virginia takes place. The battle is inconclusive. The Union wins the Battle of Yellow Tavern in Virginia. Confederate cavalry commander Jeb Stuart is killed at Yellow Tavern. The Confederates win the Battle of Cold Harbor in Virginia. Lincoln signs a bill repealing the fugitive slave laws. Congress passes a law enforcing equal pay for African-American soldiers. Back pay retroactive to the soldier’s enlistment date is only allowed for soldiers who were free men before the Civil War began. The Union wins the Battle at Fort Stevens in Washington D.C. Abraham Lincoln observes the battle in person. The Union wins the Battle of Mobile Bay. The Union army forces the Confederates out of Atlanta and capture the city. The Centralia Massacre takes place in Missouri.“Bloody Bill” Anderson and Jesse James take part in the killings. The Union wins the Battle at Cedar Creek in Virginia. Lincoln reelected President. Andrew Johnson reelected Vice President. General Sherman’s March to the Sea. The Union wins the Battle of Nashville in Tennessee. Savannah is captured by the Union army without resistance. Congress passes the Thirteenth Amendment, abolishing slavery throughout the United States. Columbia, South Carolina is destroyed by fire, most likely set by Union troops. Lincoln is inaugurated as President for a second term. Congress awards all African-American soldiers back pay retroactive to their enlistment dates. Petersburg, Virgina is captured by the Union. The Confederate government evacuates Richmond. Confederate commander Ambrose Powell Hill is killed in action. Robert E. Lee and his troops surrender to Ulysses S. Grant at Appomattox. John Wilkes Booth shoots President Lincoln at Ford’s Theater and flees. Secretary of State William H. Seward is stabbed and injured in an assassination attempt at his Washington home. Andrew Johnson is inaugurated as President. John Wilkes Booth is shot and killed in a barn in Virginia. Booth’s diary is found on his body. American Statesman and leader of the Confederacy, Jefferson Davis, is captured and taken prisoner in Georgia. Confederate General E. Kirby Smith surrenders in New Orleans, marking the official end to the Confederate resistance. All eight conspirators are convicted for the assassination of President Lincoln. Four of the conspirators are sentenced to death and hanged and the other four are sentenced to prison. 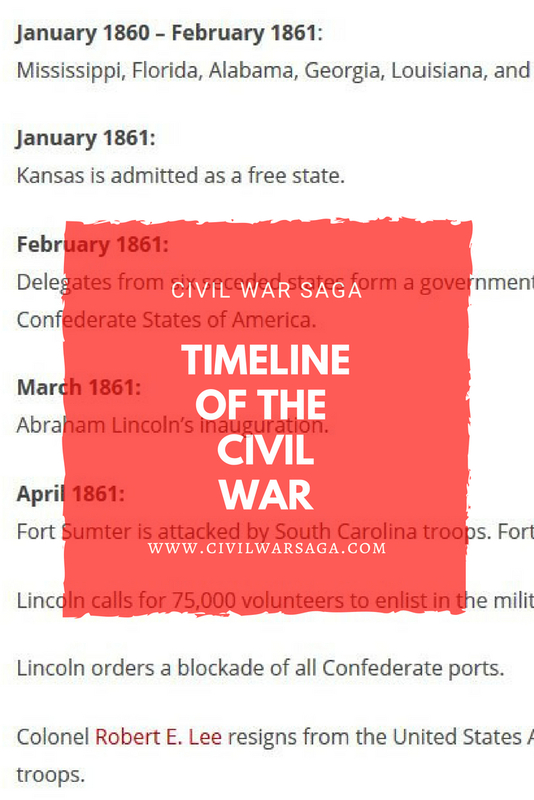 To learn more about the Civil War, check out this article on the best books about the Civil War.